When it comes to school trips and tours or programmes for groups, we know what it takes. Give us a call us in the office or submit an enquiry through the website, a member of our sales team will take details of your requirements and will then be able to accurately advise you to which programme suits your class or group. From this information, we can provide you with a provisional quote and booking. Organising a visit to one of our centres to experience the facilities and grounds for you is no problem at all. Contact us in head office and we can organise for one of our members of staff to give you a full site tour of the centre in which you desire to enquire. Upon making your booking, either Hannah or Nicola will be assigned as your dedicated account manager. They will be your point of contact handling all aspects of your trip, working with you to design your programme, organise anything from transport/room allocations and are on hand to answer any questions you may have before your arrival. In addition to your account manager, we can organise to visit your school or group to present and explain the programme to your parents or fellow organisers. On arrival, our experienced centre manager will meet you and your group to give you a welcome talk and orientation. 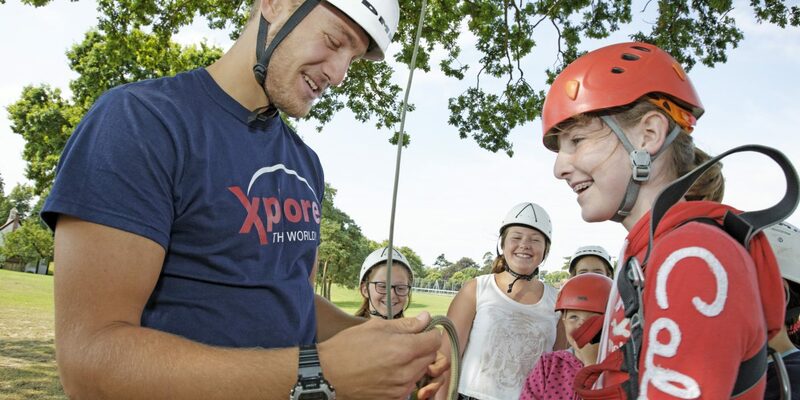 Our Xplore activity instructors and staff are then available 24/7 to supervise and support your teachers and leaders to ensure your experience meets your expectation and learning outcomes. Here at Xplore, our top priority is always safety. We have developed very safe working practices and make sure we are being monitored by national organisations to ensure we maintain those standards. Our safety statement is available and if you would like to browse our risk assessments they are also available on request. For more information, do not hesitate to contact our head office. Here at Xplore we pride ourselves on the care we provide for each individual and that is why we take safeguarding very seriously. Our experienced staff receive both internal and external training and qualifications on the subject and due to the passion we have for ensuring every young person in our care is well looked after we also hold a gold level accreditation standard from SAFECIC who provide our staff training. During our recruitment process we ensure all the relevant checks are carried out on potential staff as they complete a rigorous recruitment process. During this time we ensure that they are the right people to be working with our customers and that they are aware of the relevant welfare needs young people have. We implement our own risk assessments and stringent operating procedures based on HSE and NGB guidance, good practice and through monitoring and assessment of staff, making sure these standards are maintained. To ensure our health and safety standards are maintained, our systems and procedures are fully audited annually by independent experts. The Outdoor Education Advisors Panel (OEAP) endorses the LOtC Quality Badge and requests local authorities to recommend the use of badged providers and require the minimum of additional paperwork where Quality Badge accreditation is in place. This means that you can book your trip with confidence, meet your due diligence and reduce the amount of external provider paperwork necessary.